PM Modi said for Tamil Nadu to become prosperous, the game of DMK and Congress must end and the rule of dynasty must be stopped. He also said a vote for Congress, DMK and IUML combine is a vote for higher taxes and lower growth rate, a free hand to terrorists and criminals. "Congress and dishonesty are best friends. But sometimes by mistake, they end up speaking the truth. Now they are saying Nyay will happen. Even if they did not intend to, they have admitted that they had done injustice for the 60 years," Modi said addressing massive rallies held in Theni and Ramanathapuram district. 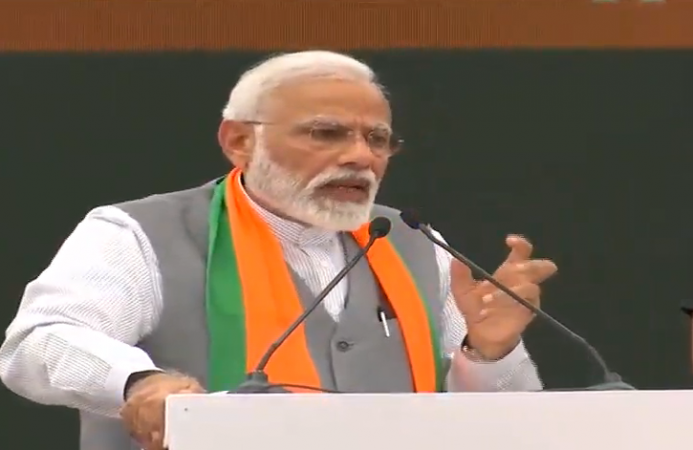 PM Modi also asked who will render Nyay/justice to the victims of 1984 anti-Sikh riots; to all the victims of anti-Dalit riots; to the government of AIADMK Founder M.G. Ramachandran (MGR) dismissed by Congress because one family didn't like him; to the victims of Bhopal gas tragedy -- one of worst environment tragedy in modern India -- all of which happened under the Congress rule. "How do you deal with those who wish to weaken armed forces and how to deal with those who talk with the sponsors of terrorists," Modi asked. "When it comes to national security, there can be no compromise. We leave no stone unturned in protecting India and destroying forces of terror. When a brave Indian pilot was captured, he was back in record time. The Congress party politicised the issue," Modi said pointing fingers at the opposition. "Those who were sworn enemies have come together to harm people of Tamil Nadu. Recall 1979, how the Congress humiliated DMK. Recently DMK leaders were in jail for the 2G scam," Modi said. Taking a dig at Congress bigwig in Tamil Nadu, Modi said while the father (former Union Minister P. Chidambaram) was India's Finance Minister, his son (Karti Chidambaram) looted the country. PM Modi said former President late APJ Abdul Kalam would have been happy on the DRDO's success at A-SAT missile launch destroying low earth orbiting satellite that was called of Mission Shakti that proved India's capability to destroy live satellite with a mission. According to Modi, work is fast progressing on laying of the railway tracks between Rameswaran and Dhanuskodi. The 100-year-old Pamban bridge is transformed into a state-of-the-art bridge. He also said a new Fisheries Ministry will be formed on May 23 like the farmer's credit card, the fishermen will also be given credit cards. "When Congress was in power, terrorists had the upper hand. City after city experienced bomb blasts. The Congress government was hapless," Modi said. Citing the memorial built for Kalam at Rameswaram in Ramanathapuram district, Modi asked: "Did Congress make a memorial at this scale for any previous Presidents of India? So many Presidents were from the Congress. They did not make a memorial for KR Narayanan, R Venkatraman or Dr S Radhakrishnan."